Borrowed an idea from Route66Rambler. Most models I could think of are here. I think. I think its amazing the number of model variations from one simple platform. And, look at all the 2 door models! Now that is a good presentation. I added a link to cleaner, tweaked printable .pdf version in the first post. Forget the whales, save the Eagles! Nice job , this would be an nice addition to display with our Eagle's at car shows. Thank You. Especially if it could be blown up to poster size. It does need some "neatness" tweaking. But what the heck -- you can't beat the price. I like your display with your Eagle. It does not have to be very big if you had many pages to display. I made this awhile back. I got the idea from another Eagle owner. It is more interesting to look at a car if you know something about it. Very nice and easily read. I have my Eagle (and Concord) stuff in notebooks for folks to go thru. On the pages that are kept open for viewing is a fact sheet about the car and its window sticker. Other pages they can look at contain the dealer brochure for the year of the car. 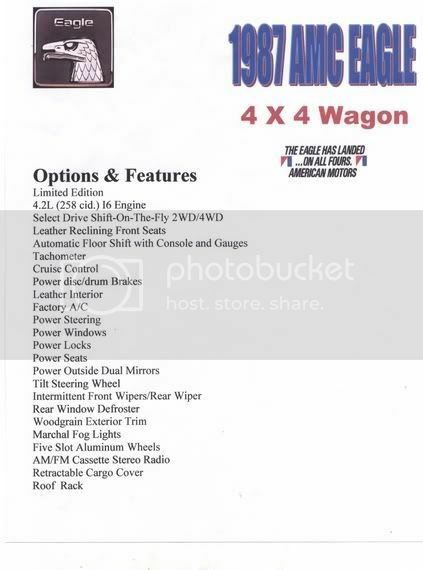 The display board, currently, markets the Nest and it also has a Select Drive ad since many folks do not realize Eagle's were 4WD until a much closer look at the car. 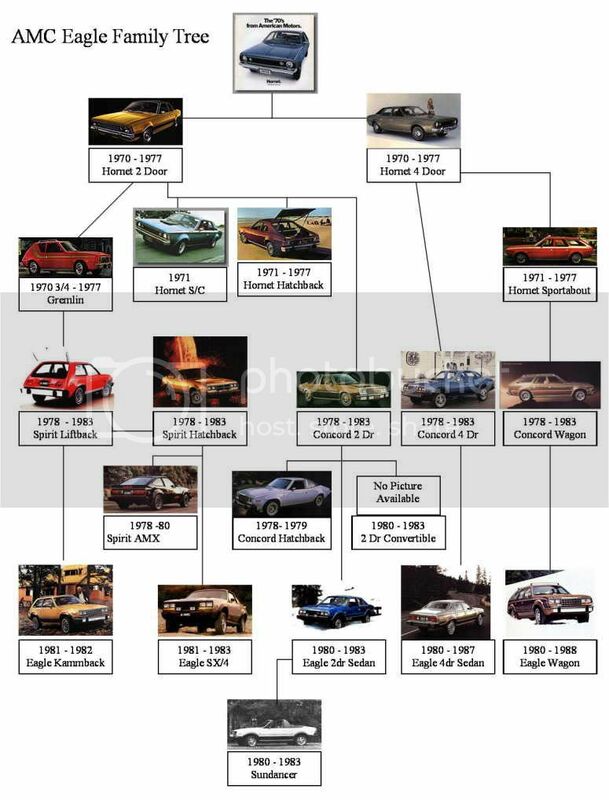 "Great Cars 1958 to '88"
I thought it would be cool to have a poster of an AMC family tree with all of the models from those years to post at the car club meetings. 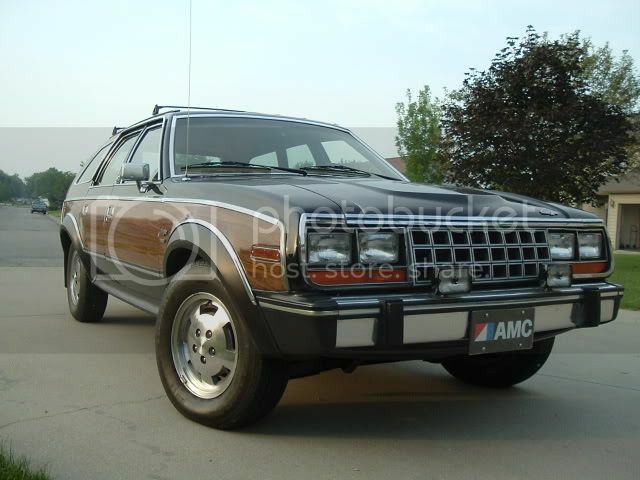 I no longer have an AMC Eagle, but I am still a fan. route66rambler is working on one of those extended family trees. I got the idea from him and just did an Eagle one. I did not go further back than the Hornet as there was enough of a change between the Rambler American and the Hornet for me to consider the American not as nearly related to the Eagle as the Hornet obviously is. The Hornet was the first AMC compact to have a full ball joint suspension rather than trunions like previous AMC's used and of course the sheet metal on a Hornet screams Eagle. I understand that. I really like the presentation. Nice job. I actually have one posted in my office for people to see. 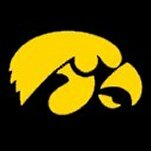 I was just curious if anyone had tried doing the extended family tree 58-88. I know people in my car club would be interested. I think we are working on getting club jackets with our cars on them at the next meeting in September. That would be cool as well. I visted with Michael (route66rambler) today, in an e-mail, to let you know of your interest. I think we really need to go back to 1954 when AMC was created. Michael is more ambitious and is going way back to the first Jefferey vehicle. That would be cool to see as well. My car club seems to have an acclectic collection of interests in vehicles, but the common thread is that they all own at least one 58-88 AMC. I have been messing around with the 54's -- took a while to find them all -- especially pictures. I can see where Michael will have a lot of fun going back before the turn of 20th century with all the predecessor cars before AMC. We think the Kammback or Sundancer are rare -- the Hudson Italia for 54/55 only consisted of 26 units. That really would be a challenge, but I would love to see the results. I am sure the internet would be very useful finding pictures. The internet is our friend. The internet is our friend. Yup, that is where I finally found 'em all.